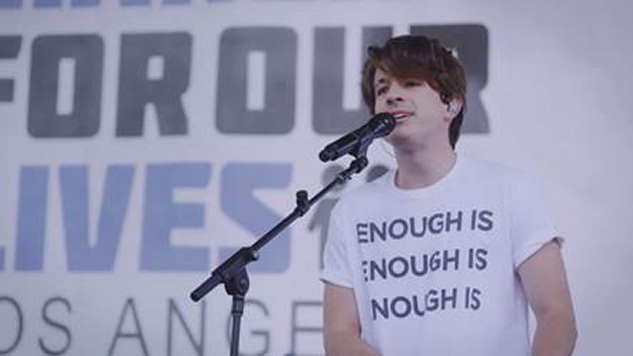 James Taylor and Charlie Puth Team Up for March for Our Lives Tribute Song, "Change"
After debuting the new song at Saturday’s March for Our Lives rally, singer-songwriter Charlie Puth has released the official audio for “Change,” featuring music legend James Taylor. The timely Parkland shooting tribute is a folk-pop production filled with acoustic guitars and light pop melodies. Towards the end of the track, the production evolves into this homage to 1990s rock and R&B, with heavy bass and rhythmic drums. Puth’s light tenor carries most of the song through the verses and the chorus, but Taylor’s light baritone vocals create the ethereal mood the song evokes. It feels like a forgotten Taylor track from his ‘70s heyday. In terms of the lyrics, both Taylor and Puth speak to a world where division and hatred could be gone if attitudes within humanity could “change.” In the first verse, Puth sings, “Why are we looking down on our sisters and brothers / Isn’t love all that we got? / Don’t we know that everyone’s got a father and mother?” Taylor comes in with, “Look around, there are too many of us crying / And not enough to go ‘round / What a mess / Another good one dying.” The message hits home in the chorus: “Why can’t we just get along / If loving one another’s wrong / then how are we supposed to / get closer to each other? / We gotta make a change.” Puth and Taylor continue trading verses as Taylor harmonizes in the background. With this collaboration with someone of Taylor’s musical status, Puth is setting expectations high for his sophomore album Voicenotes, arriving on May 11. Along with working with Taylor, Puth has collaborated on “Done for Me” with R&B up-and-comer Kehlani. Despite pre-orders opening for the album and a forthcoming summer tour, the tracklist for Voicenotes still hasn’t been released. Even though “Change” is Taylor’s first musical release since 2015’s Before This World, Taylor has been busy promoting his pop-up book Sweet Baby James along with getting ready to tour this summer with select dates as a special guest on Paul Simon’s farewell tour, along with Bonnie Raitt and the Eagles. Check out the audio and live performance of “Change” below, as well as Paste Cloud audio from a 2003 Taylor performance.